Wampler has unveiled the Fuzztration, which the company touts as a “do-it-all” fuzz box. The core of the Fuzztration is a three-band EQ with a voicing selector switch, offering sculpting capabilities from classic “Floyd-like” sounds to brash, modern doom and sludge tones. Additionally, the standalone octave effect can be used pre- or post-fuzz. Other features include top-mounted input and output jacks, soft-relay switching, and 9V-18V DC operation with optional 9v battery adapter. 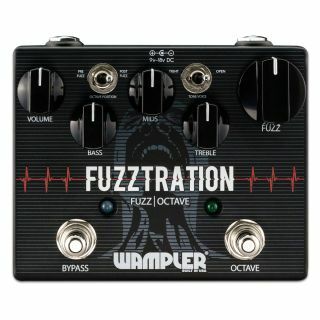 The Wampler Fuzztration pedal is available now for $199. For more information, head over to WamplerPedals.com.